Home > Blog > Emergency Dental Care: Do You Need a Tooth Extraction? Emergency Dental Care: Do You Need a Tooth Extraction? There are situations that require drastic intervention when you have issues with your teeth. One of the biggest causes of tooth extraction is advanced decay into the root. Once the decay reaches a certain point, fillings and other methods can no longer help you. At this point, the only option is to have the tooth removed and replaced with a crown. Another situation that requires emergency dental care is if you experience trauma to your mouth or teeth. Whether it be an accident or a sports injury, severely broken teeth also can’t be fixed with fillings, and must be removed. Simple Extraction – This is the most common type of tooth extraction. It is used in many cases and can be done in the dentist’s office quickly. The tooth is loosened then pulled out. This process involves numbing, then removing the tooth. This way, the dentist is prepared to move to the next steps whether it be a root canal or a crown. Surgical Extraction – This method of tooth removal is a lot more serious and involved. It is used in situations where a tooth has broken off at the gum line and can’t be grabbed out, possibly due to trauma. This process requires oral surgery and can take a bit longer than a simple extraction. 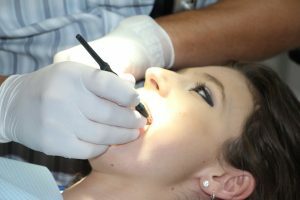 Regardless of whether it is a simple extraction or surgical, tooth removal is a serious procedure that will take some time to heal. Your dentist will help guide you through the recovery process, giving you steps to follow at home to keep the area clean, as well as planning the next procedures to replace the tooth or teeth that have been removed. Your dentist will guide you through what medicine to take to reduce pain, as well as what diet to follow while recovering. Most of the time, your dentist will prescribe painkillers as necessary for a few days until the pain dissipates. While mouth wounds can bleed more, they tend to heal quickly, reducing discomfort more quickly than wounds in other areas of the body. Once the area is healed, the replacement will be planned and executed by your dental office. Typically, artificial roots are installed, then a crown is permanently installed into the artificial roots. Whether the issue stems from decay or trauma, tooth extractions are usually a last resort. In many scenarios, your dentist will have other options to prevent removing a tooth. Unfortunately, sometimes they are necessary for the health and future of your teeth. If you have a dental emergency or unchecked decay in your teeth, contact Hassey Do Duy to get it checked out today.